It should be on my epitaph, or maybe it’s the name of a movie like the Wizard of Oz or, It’s a Wonderful Life. I’d like the name to be a bit more down and dirty, kinda like that famous scene of a Russian roulette game in the movie The Deer Hunter, with a wigged out Willem Dafoe and a scary Christopher Walken. No, that’s not right either. Maybe it’s more like Cheech and Chong’s seminal Up in Smoke. 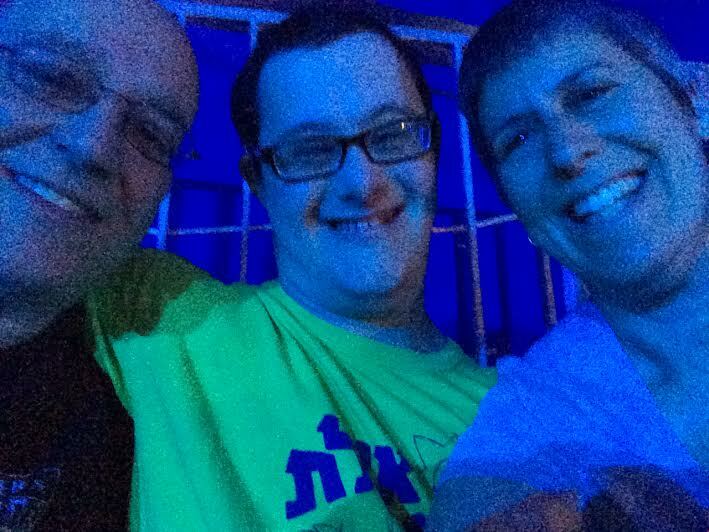 Ira, Akiva, and Beth at the circus. Ira and I played a little Russian roulette about a month ago…and lost. We always lose it seems, just when we’ve let our guard down. Not sure anyone ever gets that really. Don’t blame them, can’t really understand it ourselves. We had two lovely meals out on that particular Shabbat, a true red-letter event, at two friendly homes. We made some tasty vegetarian dishes to accompany Friday night dinner – it was a big meal around a full table with a host of Akiva fans, including his hosts who know him well. Akiva sat, ate, wandered a bit, even petted their two lively dogs and had success in the bathroom. Whew. Saturday lunch, it was another big meal around a full table (we were in charge of dessert, a decadent chocolate cake), with a group who was completely friendly to all of us, especially Akiva. Akiva sat, ate, played with toys and then…had a toileting incident on their lovely sofa. We were both horrified. The hostess was a doll. As she delicately handled the upholstery on her very beautiful sofa, and told me to relax, that “things happen,” I yammered on apologetically, wondering why we had allowed him to sit on the sofa, why we hadn’t taken him to the bathroom more (he had been taken twice), why we hadn’t brought along a special pad for him to sit on (forgot but then again, he’d done well on Friday and he hasn’t had an accident in quite some time), why we had let our guard down, and of course, why had we bothered taking him out for two meals over the course of Shabbat. That’s a challenge for us with Akiva, who’d never been to house #2. Lost in the shuffle, of course, was Akiva. On the way home from lunch, freshly attired in clean pants, he was quiet, clearly desperate for his Saturday afternoon of music on the iPad, his way of relaxing – we long ago gave up that Sabbath battle. I felt badly. He knew, on some level, that things hadn’t gone well, that he hadn’t been able to do what he needed to do in the conventional fashion when offered the opportunity. Why? I can honestly say that if I knew why, I’d know why this particular skill has evaded him, and us by definition, for so many years. If only we understood at a more base level, why people, especially those with disabilities, gain certain skills and not others. What makes expressive language such a challenge and receptive language not? I’m using our experiences with Akiva of course, I know for others it may be different. Akiva, who is very skilled in languages is very unskilled in chitchat, in expressing his thoughts, in just saying “hi, what’s new?” And that’s deeply troubling to him, social kind of guy that he is. We all know people who are deeply shy, those who do struggle, quite painfully to navigate social settings. Or those, who stammer and stutter, who dream of speaking freely whenever they’d like. For us, Akiva’s family, as well as others in his life, from his teacher to the therapists and Shutaf staffers who know him well, it’s often a mystery to determine what’s on his mind and what he’d like to share with us. There are those who would say he functions at X or Y age level but we prefer to see him as someone who has the life experience of a young teen and as such needs to be respected accordingly. But it’s complicated when he needs help with everything he does and when certain skills of independent living continue to elude him. So, we cope. We respect him. We support him, and welove him. Our own Wizard…in a Wonderful Life. Sometimes expressions created out of a desire for political correctness are nevertheless apt. I like “differently abled”. I had a sister with down syndrome. She appeared to most people to be non-verbal and, in fact, when a stranger would speak to her she often responded by saying “I not talk”. But she did communicate, quite well if only you paid attention. She had Shabbas all figured out and never mixed up milkhik and fleishig dishes, but how much she understood those things was never completely clear. (That isn’t to say she didn’t rebel against them once in a while, like the times she sneaked chocolate bars into her lunch bag, when meat sandwiches had been packed.) When she, whom our parents had presciently named Ahuva, passed away a couple of years ago at age 46 – 45 years later than the experts had predicted at her birth – I realized that she had lived her life according to its natural arc. She was exactly the person she was supposed to be. She was not disabled until late in her life when, as happens to most of us, her general health deteriorated. If she seemed not to “get” some things, I’m sure that to her I didn’t “get” other things. And like Akiva she had her fans – mostly nieces and nephews but also the kids at the local playground, people at the Chabad House and the shul. She had her separate friendships, forged at the sheltered workshop that was a big part of her life for half of it. And nothing caused her to light up more than seeing the products that she and her co-workers assembled and packaged on display at local shops. She had her preferences – cats over dogs, Coke over Pepsi, ketchup not mustard on her hot dogs, butterscotch pudding over chocolate, but chocolate over vanilla. She was afraid of flying but loved motor trips, especially by motorhome. For a while she was a big fan of Michael Jackson and Duran Duran (go figure!) and when choosing a TV channel she always looked for the mouse ears logo in the bottom of the screen. So hang in there and enjoy the ride. Each human is differently abled from each other one. Some have the necessary aptitude to practice medicine. Some are good at accounting – and actually enjoy it. Each has different likes and dislikes – how else do you explain that the music industry has given us both Lady Gaga and Tom Paxton,,,or yogurt as a snack food? Your hostess was right, “things happen” – to all of us, just different things. Yesterday I misread a sign and turned the wrong way into a one-way roadway. Try as I might every time I try to pop popcorn in a pot I burn the bottom of the pot. We survive our little embarrassments and those around us either accept our foibles or do without us in their lives. So it goes. We are all differently abled.